The following article was published in the Los Angeles Times on January 11, 2004. Braving the perils of the historic road -- and nearly succeeding. Baker, Calif. — Some people love the desert. They love it at 110 degrees with the AC off. They love rusted junk, abandoned mines, sand traps, rattlesnakes, old bones and dry washes. You're pretty sure they're touched until you go there with them, as I did in October with my brother, John. He'd been wanting to drive the 130-mile Old Mojave Road, a dirt, rock and sand path across Mojave National Preserve that passes landscapes you don't get to see on paved roads. It was the historic route from the Colorado River to Barstow for Native Americans, explorers, stagecoach drivers and the Army. When the railroad laid tracks to the south, the old road was all but forgotten until Dennis G. Casebier, a Navy physicist from Corona with a passion for desert history, decided it should be re-opened for recreation. In the early 1980s, the Friends of the Mojave Road, founded by Casebier, mapped, repaired and erected stone cairns along the desert route. 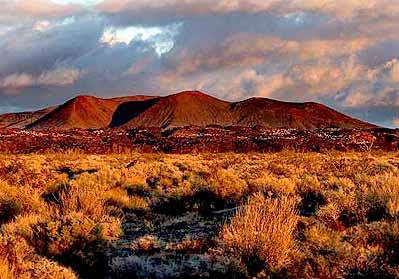 But with the creation of the 1.6-million-acre Mojave National Preserve in 1994, the group's custodial role diminished. Now Casebier has moved on to tending a historic schoolhouse museum in the Mojave Desert hamlet of Goffs and collecting oral histories from people who once lived in the East Mojave Desert. But he still sometimes checks the mailbox his group installed near Kelbaker Road, where people record their passage over the old road. Casebier estimates that several thousand make the trip annually. One tends to think all deserts are the same, places that get only a scant amount of rain. But in North America there are four kinds: the Great Basin, Sonoran, Chihuahuan and relatively small Mojave, all in Mexico and the U.S. Southwest. If a desert has something to teach, I want to learn. Then too, I like tagging along with John on hiking and backcountry driving trips. He has the skills and gear, although when camping he would eat protein bars for breakfast, lunch and dinner if I didn't bring along some real food. For protection in the wilderness, he takes my grandfather's World War I saber, about as deadly as a papier-mâché prop in an operetta. He pores over maps before setting out and then basically ignores them in order, I think, to give expeditions a sense of discovery and adventure. John told me this would be a very rough trip — two days of driving and one night of camping — and that I better not wimp out, the way I did a few years ago when I made him turn back on the appallingly rugged road that leads to the Maze District of Utah's Canyonlands National Park. I rented a beige Ford Expedition with four-wheel drive and left a day ahead of John so I could see a few sights, including Kelso Depot. This desert oasis at Kelbaker and Kelso-Cima roads (two of the paved arteries that cross the preserve) was born with the completion of the railroad between Salt Lake City and L.A. in 1906, when there was considerable mining in the area. But passenger trains began bypassing the little settlement after World War II. The handsome early '20s Spanish Revival train station, with its restaurant and regal stand of palm trees, was left to molder. Now the National Park Service is in the final stages of renovating the building as an interpretive center and museum, scheduled to open this summer. It's a good rest stop between visits to the Cinder Cone Lava Beds about 15 miles north and Kelso Dunes to the south. Then I headed up Kelso-Cima Road, which rounds the south side of gently sloping, astonishingly symmetrical Cima Dome, a 75-square-mile area of volcanic uplift in the wild heart of the preserve. The two-lane highway, often used as a shortcut between Palm Springs and Las Vegas, is straight and flat, paralleling railroad tracks before branching off across the Ivanpah Valley. The sun was setting in a pink puddle by the time I reached Nipton, on the northeast side of the preserve, with its bushy tamarisks, pint-sized hotel and general store. I chatted with the clerk and drank a soda before heading for the Avi Resort & Casino, on the Colorado River about midway between Needles, Calif., and Laughlin, Nev. I am not much of a gambler and had never been to the Needles-Laughlin area, where the tamed Colorado River is a bathtub favored by motor boaters and water skiers. But the eastern portal of the Old Mojave Road is near the Avi, which is owned by the Mojave Indians who settled the river's flood plain and helped blaze the trail that became the road. They led Spanish explorer Father Francisco Garcés across the desert in 1776 and did the same for the American trapper Jedediah Strong Smith in 1826. But eventually, relations turned hostile between newly arriving white people and the Indians. As a result, in the 1860s the U.S. government built a chain of forts along the old desert trail, which by then had become a rump-blistering wagon road carrying supplies and mail. I doubt the people at the Avi, propped at slot machines with plastic cups full of quarters, were thinking about history. Together with the casino's garish lights and the gorging at the Native Harvest Buffet, they vaguely depressed me, so I went to my room — big, clean, simply furnished, not bad for about $25 on a weeknight — and went to sleep, anticipating a rendezvous the next morning with John, who wasn't able to leave L.A. until after work. I banged on his door at 9 a.m. and had a map spread out on a table in Avi's Feathers Café when he showed up for breakfast. Our plan was to drive half of the road that day, camp overnight and finish the next day, coming out at Afton Canyon just south of I-15 between Barstow and Baker. Then we would head back to the Avi, where we were leaving John's car, for a dip in the pool, another go at the buffet and beds with clean sheets. But we were in no hurry, because two days of driving would easily get us over the road, with time to stop and explore such features as Soda Dry Lake on the west side of the preserve. After rainy weather, it becomes a vast, tire-swamping mud flat. When John saw the Expedition, he said it was probably too heavy to make it across the playa, but he cheered up when I told him it was insured for every conceivable mishap. We packed the water, food and gear John had brought, spent a cool $50 filling the gas tank and set out. The unmarked turn-off west across the desert was about three miles north of the Avi; we found it with the help of Casebier's "Mojave Road Guide," annotated mile by mile. John made me manage the wheel at the beginning, to prove I could do it. Like most novice dirt-road drivers, I tended to take my foot off the gas when we came to sand. But my brother kept saying, "Follow the ruts. Keep going. Don't stop." Then he cracked open a liter of Coke and yelled out the window, "No problem anyway! We're fully insured!" That day was a pure desert joy from start to finish. The temperature was about 80 degrees when we left, and the sky was mounded with clouds. A lop-eared jackrabbit jumped out of a nest of creosote, birds tittered, the air smelled like a spice rack. And, suddenly, everything sharpened up, as it will in the desert, from the yellow rabbitbrush to the brittle Piute Mountains, as if I'd just had Lasik surgery. About 23 miles west of the Colorado River (using Casebier's distance calculations), we reached Ft. Piute, one of the military redoubts built on the road in the 1860s. It sits in the shadow of Jedediah Smith Butte, above dependable Piute Creek, and once harbored 18 enlisted men of Company D of the 9th U.S. Infantry. John went looking for Native American petroglyphs in the creek bed while I ate a packaged cheese-and-cold-cut snack on the knee-high stone walls that are the remnants of the fort. Just before we relaunched our Old Mojave Road sortie, he did a saber dance in front of the Expedition with Grandpa's sword. With John driving, we climbed 3,412-foot Piute Pass, infamously rough in the old wagon road days. The view west swoops over the Lanfair Valley, where homesteaders tried to make the Mojave bloom in the early 20th century, to range upon range of desert mountains, separated by basins, in a Western geography lesson. From there, we tooled across the valley, so thick with Joshua trees you would think they had been propagated. Here and there we saw old stuff scattered over the desert, including a wrecked school bus that made me think of the Beatles' "Yellow Submarine." There were also mysterious turnoffs that John said could lead to crystal methamphetamine labs. He likes to put me on edge. When I asked if we needed gasoline, he routinely said we were about to run out. We crossed paved Ivanpah Road at Casebier mile mark 41.7 and caught graded Cedar Canyon Road west to avoid a more treacherous stretch of the Old Mojave Road along Watson Wash. Eventually, we reached Government Holes, where one of the last gunfights in the West took place in 1925. It's a pretty place in the Round Valley, with a windmill and abandoned corral, and we considered making camp. But it was starting to get chilly and there were no windbreaks, so we turned south on Black Canyon Road, heading for Mid Hills Campground in aromatic forests of pinyon pine and juniper. There we claimed site No. 25, with the preserve's best view of Cima Dome. A fire pit was stocked with wood, left by some friendly earlier camper, and there was a nice flat place for my tent. John set up his cot outside so he could see the stars. We had steak and apples for dinner, talked for a while and then went to sleep. I slept like a sunken ship and awakened in time for sunrise over Cima Dome. Another day in the desert ensued, not quite as good as the last. We lost our way, making an unintended detour north toward Death Valley Mine on a track that kept getting fainter and fainter. Finally, we reached the paved Kelso-Cima Road, where there's a little convenience store and post office run by tiny, wizened Irene Ausmus, who came to the Mojave with her husband in the 1960s and refused to sell out when the National Park Service arrived. It wasn't hard to find the Old Mojave Road again, with Casebier's help. In fact, the road's rutted route can be seen for miles as it pushes west across Kelso Wash and rounds the Beale Mountains, named for explorer Edward F. Beale, who tried to introduce camels to the Mojave in 1857 but had to abandon the experiment because they frightened the horses. The views north to Cima Dome and south to Kelso Dunes only got better. But just east of Marl Springs, John realized we had a flat, necessitating an hour of hot, dirty work mounting the humongous spare. There was some cursing, after which we decided to get to Kelbaker Road, about 20 miles west, as soon as possible, so we could drive to the town of Baker on I-15. With the rigors of Soda Dry Lake ahead, it seemed prudent to get the blown tire fixed so we'd have a spare. In Baker, we stopped at the Park Service information office, where a ranger gave us more bad news. Autumn rains had made passage over the playa dicey. Several vehicles had gotten stuck there recently, languishing for days awaiting rescue as the salt crust of the dry lake corroded their undercarriages. John wanted to risk it, but the day was more than half gone. Over a lunch of hummus, fried calamari and gyros at the Mad Greek restaurant, I persuaded him to abort and head back to the Avi. So we can't say we drove the whole road. Our names don't appear in the record book at the Old Mojave Road mailbox, which we bypassed in our rush to Baker. But John plans to return and conquer the playa. Maybe I'll go with him. I'm starting to understand why he loves the desert. Besides, I'd like to see him brandishing Grandpa's saber again. Mojave National Preserve is about 200 miles northeast of Los Angeles. From L.A., take Interstate 15 northeast to Baker and turn south on Kelbaker Road, or take Interstate 40 east from Barstow and turn north on Kelbaker Road, to reach Kelso Depot, a major historical site in the preserve. The eastern portal of the Old Mojave Road is on Needles Highway about halfway between Needles, Calif., and Laughlin, Nev.
Spring and fall are the best seasons to drive the Old Mojave Road. Consult the Mojave National Preserve or "Mojave Road Guide," by Dennis G. Casebier (Tales of the Mojave Road Publishing Co., Essex, Calif.), for information on how to prepare for the trip. Two campgrounds in Mojave National Preserve, Mid Hills and Hole-in-the-Wall, have drinking water and toilet facilities. Sites are $12 per night. Roadside car camping is also permitted, with restrictions. Avi Resort & Casino, P.O. Box 77011, 10000 Aha Macav Parkway, Laughlin, NV 89029; (800) 284-2946, http://www.avicasino.com/. This complex on the west bank of the Colorado River has rooms in a new tower or an older poolside building. Doubles start at $19 Sundays to Thursdays, $49 on weekends. Hotel Nipton B&B, 107355 Nipton Road, HCR-1, Box 357, Nipton, CA 92364; (760) 856-2335, http://www.nipton.com/. This homey desert enclave is on the northeast side of the preserve. It has a general store and five guest rooms with shared baths. Doubles are $69.50, including breakfast. Laughlin and Needles have a range of casino and fast-food restaurants. But if you're driving through Baker on I-15, don't miss the Mad Greek, (760) 733-4354, for serendipitous gyros, souvlaki and fried calamari in the desert. Lunch for two about $20. Mojave National Preserve Headquarters, 222 E. Main St., Barstow, CA 92311; (760) 255-8801, http://www.nps.gov/moja, or the NPS Baker Information Center, 72157 Baker Blvd., Baker, CA 92309; (760) 733-4040. Mojave Desert Heritage & Cultural Assn., Goff's Schoolhouse, 37198 Lanfair Road G-15, Essex, CA 92332; (760) 733-4482, http://www.mdhca.org/.